15 days or more before arrival: full refund minus an administrative fee of 10% or $100 ( whichever is greater) to cover all bank transactions and other finantial costs. 15 - 0 days before arrival, The fee will be 100% of the total payment. - Please avoid leaving valuable items in the room. We dont take responsibility for any lost. Ask for our safe deposit box. - Visitors are not allowed in rooms neither in the pool area. Just in the entrance hall. - Alcoholic beverages are not allowed unless you buy them at the hostel. Only private rooms available for group booking, not dorms. The best backpackers hostel in Guayaquil. A hostel built in order to fit your needs and help you enjoy the hostel life while traveling. We provide affordable accommodation for backpackers and travelers who enjoy a chill, peaceful and cosy place to stay in while in the city chaos. Our facilities are designed to offer a friendly atmosphere where you'll feel like home. Guests can enjoy a very sunny day on our pool while enjoying a drink or even piece of seasonal fruit from our own backyard, we also have a communal kitchen, where guests can make themselves a healthy meal or quick snack and even shared with others. very pleasant hostel, nice patio area, super cleaned. Only downside is that rooms are very hot and no a/c fan only. Lovely pool, helpful staff, clean rooms and bathrooms. cute dog Nacho! Would definitely recommend for anyone who wants to relax by the pool and chill but not a party hostel if that’s what you are looking for. V nice clean efficient hostel with a pool. Lots of communal areas but v few people when I stayed so lacked atmosphere. But the guy on reception, Joah (?) was v friendly and helpful. 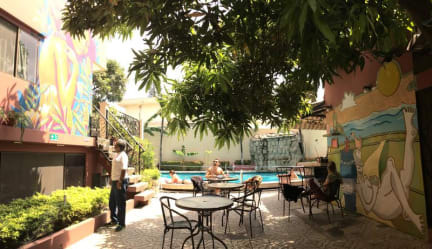 Great free breakfast and hostel was well located near to airport/bus station and amenities. Recommended! Atmosphere could be better especially with the nice pool they have. Guayaquil weather when we were there didn't help. Free breakfast is good but very small and they're a bit cheap on coffee. Nice clean hostel with a good kitchen. Breakfast was nice, eggs, toast, bit of fruit, fresh juice and tea or coffee. Location is ok, but far out from the main area but an Uber is $3. There is a swimming pool but we didn’t get to use it because it rained. Main issue - no hot water!! It is hot but at least warm water would be nice. Nobody wants a freezing shower everyday. There is a lovely hostel dog Nacho, completely harmless! The pool is what makes this place. It was much appreciated after a humid walking tour around the city. Location isn't fantastic, you are a long way out of the city centre in a neighbourhood such we were repeatedly told was quite dangerous (though we didn't see any trouble). Also breakfast was a bit on the stingy side, though they have an extensive kitchen to make your own food in. Needs a serious overhaul and redecorating. Grubby and felt unclean. It felt safe and pool was nice. However the dorm rooms are in bad need of refurbishment. Room was also sweltering - no air con and one of the fans was broken. Walls were grubby. Rooms need a serious refurbishment. Booked a private room and it was super dirty and hot, the fan barely worked and no locker was provided for safety and a window was broken so bugs everywhere - was a complete waste of money. However, pool is nice and staff were very helpful over email. But apart from that I would not recommend.